Labradorite is treasured for its exquisite display of cold, wintery colours, hues ranging from peacock blue to dark grey to violet to blue-green, and for its labradorescence, by which light, upon entering the gem, is refracted creating a mesmerizing iridescent effect reminiscent of the effect of the Northern Lights. 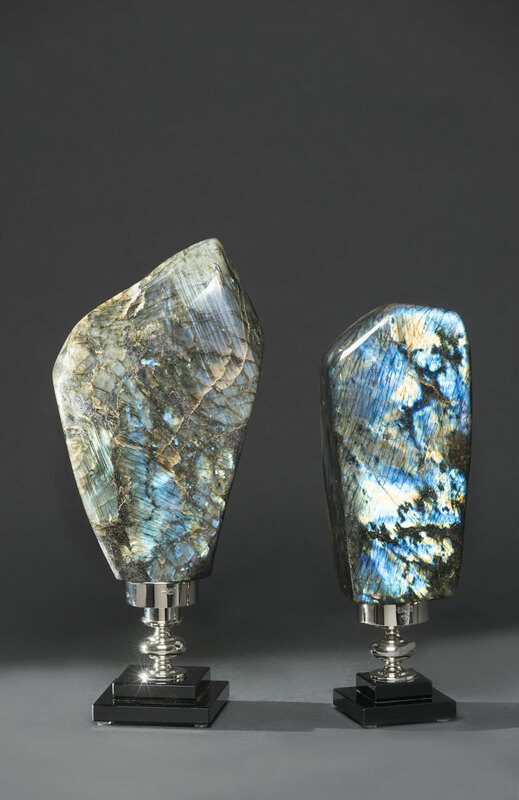 Labradorite gems are used to create gorgeous custom jewellery and eye-catching ornaments. They also make powerful healing stones, protect the aura and bring with them the gift of serendipity and synchronicity, together responsible for making amazing things happen in one’s life. This is a feldspar mineral, more specifically it belongs to the Plagioclase Feldspar group series. Within such series Labradorite is the intermediary member, with Albite at one end (containing sodium and no calcium) and Anorthite the other end (containing calcium and no sodium). 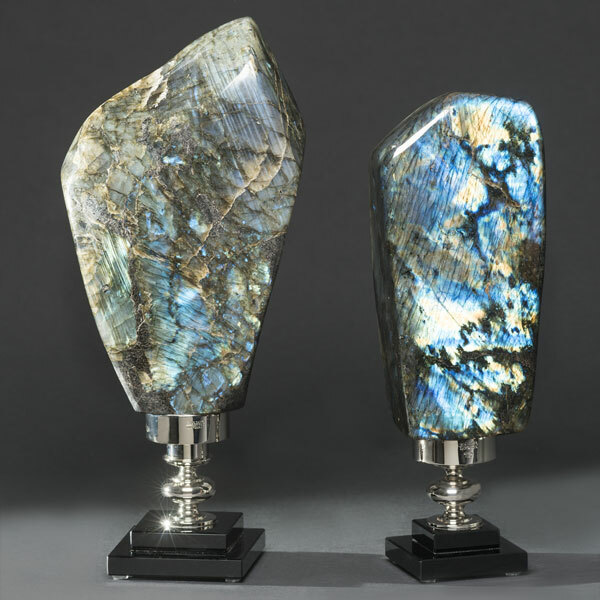 In the sodium/calcium ratio of the structure, Labradorite is defined as a mineral containing 30-50% sodium and 50-70% calcium. Labradorite was first discovered by a Moravian missionary in 1770 on Paul’s Island in Labrador (its name sake), north-east Canada. Some of the most prominent deposits are in fact found in Labrador and Newfoundland in Canada, specifically at Nain and Tabor Island. The most impressive gems come from Madagascar and Finland. Though it is claimed Labradorite was discovered in 1770 by missionaries, it is known this gem was used by the Beothuk peoples in northern Canada much earlier than the late 18th century and had been referenced in older Inuit legends. One of these recounts that long ago the Northern Lights were trapped within the rocks along the Labrador coast in Canada, till an Inuit warrior saw them and decided to set them free. The warrior was able to release most of the lights with just one blow from his spear. Some however stayed imprisoned within the stones in what are hypnotic Labradorite gems.